I am so sorry i haven’t posted anything this this week. Life, and illness, got in my way. — We had a graduation party for my daughter on Saturday. My sister-in-law made this awesome cake for it. — Sunday we just hung out and I got to see a friend at Mass who is soon leaving to become a nun. It’s actually quite exciting as she’s my age, a widow and has two grown children. She’s joining a new order whose mission is for women over 25 and widows. I’m so happy for her. I made her a rosary but haven’t had a chance to get it to her. — Monday I went to Weight Watchers and I was down 1.8 pounds. That’s six pounds in two weeks! I’m really stunned but happy. — Tuesday I woke up ill. I had a dentist appointment that I had to cancel, and while I don’t like going to the dentist, I was kinda looking forward to this one. I have an abscess over a tooth I’ve been having trouble with and while it doesn’t hurt, I know I’m going to need to do something. Anyway, I rescheduled the appointment but I’m going to have RE-reschedule as it’s now on the day Steve and I leave for Huntsville for Deep South Con 50. — Wednesday I felt better and went to see my GP for my six month follow up. All my blood work looked good except my thyroid hormone which I knew because my nephrologist already told me that would have to be taken care of. My feet swell and he says it’s not fluid and my kidney function is excellent. — Yesterday was the last day of school. Noah got out at 11, but I thought it was 11:30 so he was the last kid in third grade picked up. Again, the award for best mom goes to me! We went to Chick-fil-a for lunch and Juliette joined us. Lots of kids and lots from his school were there. Later, at home, he went out with his bike and I lost him!!!! I had plans to go eat with some friends and his dad was coming to meet us from work and take Noah to a birthday party but when it was time to leave for the restaurant, I couldn’t find him. I drove all over the development, trying to spot his bike and figure out where he might be. Finally, with the help of neighbors, we went to his friend’s house. Her father said he knew where Noah was and sent his son, on his bike to show us. Turns out he (Noah) was at a house on the other side of the development I would NEVER have thought of looking. He was safe and playing and had no idea there was a problem. I told him he has to tell me where he is at all times. His dad had come home by then and we got the birthday present situation handled and I went to dinner and writing time with the Rowdy Girls! — Friday, nothing is happening today except writing. Still not 100% well, but with no school, I can relax. An abscess is not fun! I hope you get it taken care of before it starts hurting! It’s funny, but my name is Nancy and I wrote about the dentist today????? Great minds??? 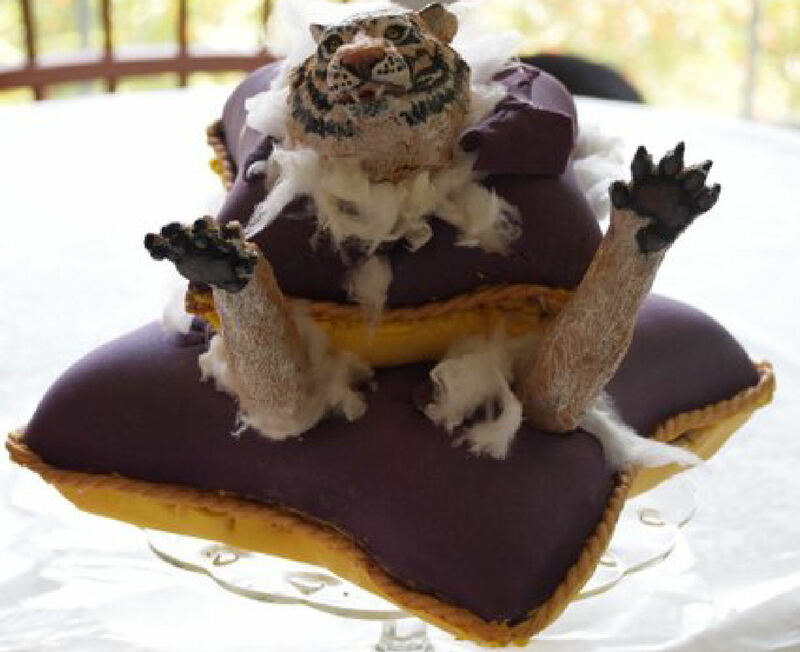 That’s a cake? Oh my, I would NEVER have guessed. “With no school, I can relax.” haha As a teacher, I look forward to saying that in 10 days. Hope you’re feeling better. Thanks for linking up!